Hi guys, I hope you have remembered review of System Mechanic Free and Standard. I had no idea of System Mechanic before testing that for review and after testing that I am almost certain that currently it is the most complete and careful system maintenance suite available in the market. Recently System Mechanic 11.5 has been released with a number of new features and enhancements including Guided Recommendations and new Windows 8 performance enhancements. System Mechanic 11.5 breaks new ground with a combination of patented technology, expanded controls and enhanced intelligence that can advance your computer’s operation beyond even the toughest performance barriers. AcceleWrite™ : New real-time technology that optimizes file organization on both solid state drives (SSD) and traditional hard disk drives (HDD). Startup Optimizer™ : New advancements in System Mechanic 11.5 coupled with ongoing research from iolo Labs and the collective intelligence of the entire System Mechanic community result in even broader startup coverage. Now it’s easier than ever to identify and root out unwanted programs that silently leach horsepower from startup and other high priority activities. Patented ActiveCare® Technology (US Pat 7,873,877): ActiveCare is now easier than ever to configure, with setup profiles that allow you to apply one-click maintenance options to your entire PC without the guesswork. System Mechanic’s exclusive idle-time optimization kicks in when your PC isn’t being used and releases full control when you return — so your system always stays ready for action. Tune-up Definitions™ : System Mechanic is now fueled by well over 30,000 independently identified solutions to common issues that arise from everyday use. This makes all the tools and functions that rely on this crucial data more effective than ever before. Program Accelerator™ : Speeds up overall program responsiveness by re-aligning all of a program’s dependent files on the hard drive. EnergyBooster™ : Boost speed by turning off unused background programs. Total Registry Revitalizer™ : Repair, compact, defragment, and backup your Windows registry in one step. PC Health Status App : Designed exclusively for the Windows 8 tiled user interface, the PC Health Status App lets you keep track of your system efficiency and health status at a glance. All-in-one PC Cleanup PowerTool™ : All-in-One PC Cleanup has been greatly enhanced with additional junk file patterns, new ways of detecting and removing insidious system clutter, and improved scan speeds. Removes new file patterns exclusive to Windows 8, Windows 7, Vista, and XP. Removes clutter from all major web browsers, including Internet Explorer, Firefox, Google Chrome, Safari, Opera. Removes clutter from all major online chat programs, such as AIM, Skype, Yahoo!, MSN, and more. Removes clutter from all major web toolbars, such as Google, Yahoo!, and more. System Mechanic 11.5 is automatically available at no charge to all existing users with an active iolo service plan, which provides all product updates and upgrades, as well as continuous Tune-up Definitions updates. System Mechanic 11.5 Standard costs 49.95 USD and can be purchased using this link. Get 20% Discount: Use Coupon Code: w10 or iolo20 or use this link or this link. System Mechanic 11.5 Pro costs 69.95 USD and can be purchased using this link. 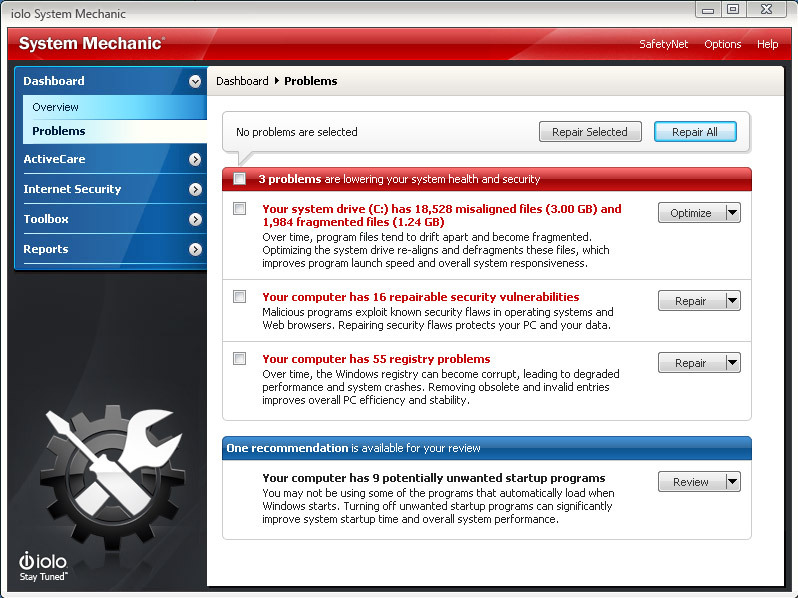 This entry was posted in News, OS Enhancement, OS Maintenance, Software, Windows and tagged System Mechanic.